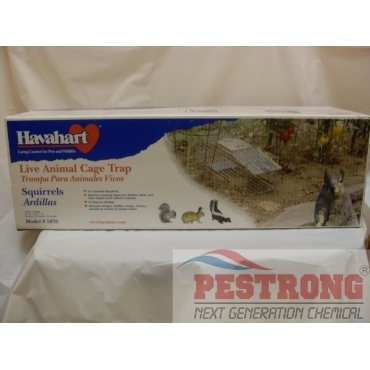 Where to Buy Havahart 1078, Havahart 1078 Medium 1-Door Cage Trap 24 x 7 x 7 - $41.95 for Sale with Fast Free Shipping! Havahart 1078 Medium 1-Door Cage Trap 24 x 7 x 7 is a economic trap for raccoons, opossom, woodchucks, groundhogs, rats, wildcat & other mid-to large animal. Pesky squirrels run all around my home, around my garden, everywhere. I decided to buy this one instead of the larger ones, because I was only dealing with small squirrels, not raccoons. And I was worried the big ones wouldn't be as effective at catching smaller creatures. This trap comes pre-assembled, so for someone like me, who is terrible with assembling any kind of contraption, this was a godsend! I baited the cage with some food, laid out the trap, and went off to do some housework. Within half an hour, one of the little suckers was caught! The trap door was solid and the critter couldn't unlatch it. I took the cage, drove off to a forestted area, and let the little guy out. I repeated the whole process until I caught and relocated all them squirrels. This is such a lovely product. It protects you and your loved ones and your home from animals that can be harmful, but it's also great for the animals because it isn't hurting them! If you have an animal problem, get these instead of using dangerous things like poisons or fatal traps.